This stovetop iron is specifically made for baking ostie, traditional wafer cookies that almost as thin as paper, and popular in the Molise region of Italy. Similar wafers are known in other cultures as waffles, crackers, oplatki, cialde, hostie, ouwel, obleas, hostia, pain azyme, oblaten, and more. Through the ages their form has been utilized for foods of substance, for sweets, and also for religious symbols. These delicate wafers can be cut, decorated, and used for lining pans for baking (panforte, for example). Right out of the iron, they’re hot and pliable, and can easily be trimmed or shaped into bowls and cones for any type of filling. The traditional recipe has a neutral taste, with many adaptations that thicken or sweeten it, and include fillings right in the wafer. Many delicacies, such as Brigidini, are made with this iron. Place the baker on a dishcloth. Lightly coat the cooking plates with olive oil on a pastry brush, to keep the cookie from sticking. Heat the baker on the stove top, both sides, until the baking temperature has been reached. Use the wood handles to open the baker. Put batter on the plates with a spoon, and close with the wood handles, using gentle pressure. After the cookie is baked (20-40 seconds, depending on the thickness of the batter), open the baker. Remove the cookie by gently lifting with a knife or fork. It is recommended that you allow the cookies to cool on a rack, or on a paper lined tray. When you’re done baking, make sure the surfaces are completely cooled, and wipe with paper towels. Close and store for your next use. On first use, dispose of the first 2 or 3 cookies baked, to insure maximum cleanliness of the new plates and your finished baked goods. The wafer baker will be easiest to use on a grate over a gas flame, however it will work over electric elements as well. Consider using a heat diffuser or trivet between flat elements and the baker. These wafers have the traditional neutral taste, and can be used for any sweet or savory application. • Adding water a little bit at a time, mix the flour into an even creamy consistency. • Place the closed Ostie Iron over a medium flame until hot, turning over to evenly heat both sides. • Lightly oil the baking surfaces of the plates with a cloth or paper towel. • Drop a spoon of batter on the bottom plate, close quickly and turn over after 7 seconds to bake the other side for a similar time. • Open the iron and remove the ostia with a fork. • Keep the plates lightly oiled as you bake. • Trim the edges with a pair of scissors. 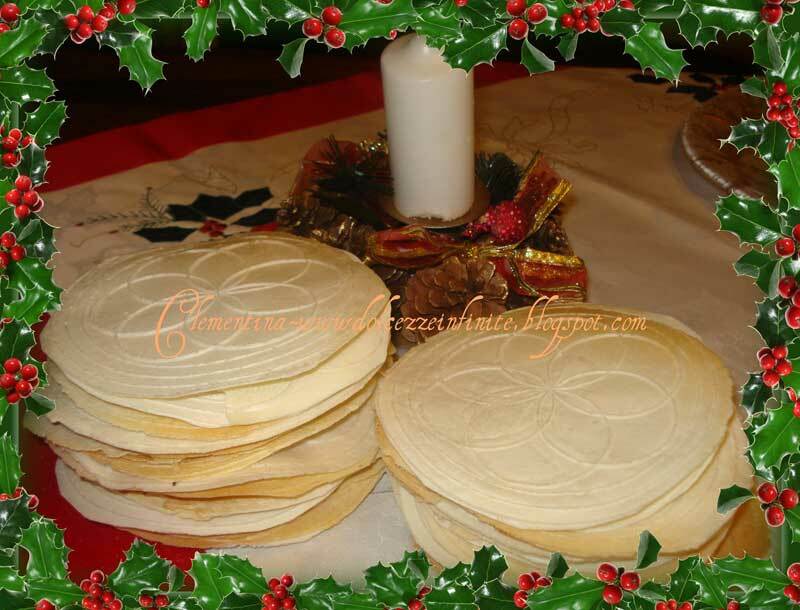 • Stack each baked ostia in a pile, and place a dish over the stack to keep them flat. • If you prefer to shape them, do so while they are still hot and pliable. • After they have cooled, store them in an airtight container. Using the ingredients in the order listed, prepare a smooth and homogeneous batter. Heat the iron for a while (at one time, it would be put on coals, today on gas ranges), on both sides. Open it, oil it, and place in its center a spoonful of the batter, close it quickly and leave it cook for some seconds. Delicately detach the baked ostia and, with scissors, cut the parts that spread out of the iron. Place the hot ostia under a weight to keep it from deforming while cooling. In a saucepan, boil, over a medium flame, the honey and sugar for about half hour, until it begins to become stringy. Add the chocolate, cocoa, grated orange rind, cinnamon, coffee, nuts and almonds. Blend everything over heat for a few more minutes. Keep the finished product hot in a double boiler. Using a fork, uniformly spread a 1 cm (3/8″) layer over one ostia at a time; cover it with another ostia and place it under a weight to make the layers stick together. Leave them like this for several hours. A scale with metric measurements is an essential tool if you want to successfully replicate these recipes. Often the terms “Wafer Paper” and “Rice Paper” are used interchangeably in the US for a number of substances that are paper thin. Decorative rice paper is made from the grass fiber of the rice plant, or from the bast fiber of the kozo plant and edible rice paper is made from rice grain. Wafer paper is made from wheat flour or from potato starch. Finely ground wheat flour, water, and vegetable oil are the traditional ingredients for these thin wafers. Most wafer paper sheets available today use potato starch instead of wheat flour. Shaped Cialde – Cialde a go-go!!! !